The British Cardiovascular Society is the voice for all those working in the fields of cardiovascular care and research in the UK; we aim to represent and support both the professionals who work in cardiology and the patients for whom we want to encourage the best possible treatment. A UK Registered Charity since 2002, we are committed to enhancing and maintaining the highest standards in training, education and research and to set standards of clinical excellence for the benefit of patients. Read more about our aims, mission and history. 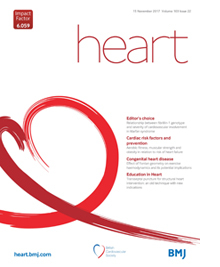 are co-owned by The British Cardiovascular Society and BMJ. Access to Heart Online is FREE to BCS Members. BCS Members also receive a discount rate for the print subscription.